National freaking Rum Day. I’m not one to buy into those fake national “holidays;” I don’t like the idea of celebrating pancakes or bicycles or whiskey on a single day. If you love pancakes, then every day should be pancake day. That’s the way my eight-year-old son lives. He finds something that he really, really enjoys then consumes the hell out of it every day until he can’t stand the sight of it anymore. Chocolate chip waffles, peanut butter and banana sandwiches, edamame…his food obsessions are fleeting, but they run deep, like a middle school crush. I admire his enthusiasm, and I think it might be rubbing off on me because I found a cocktail that I think I could drink every day…at least until the weather turns. It’s Bacardi’s Refresco Superior, a bright, lime-forward refresher that hinges on a cilantro-ginger simple syrup. It’s the perfect cocktail to cool down with at the end of the day. Maybe the best part about this particular drink, is that it was sent to me in the mail via The Cocktail Courier. Subscribe to the Cocktail Courier’s service and they’ll curate a series of recipes and send you a box with everything you need to make a round of drinks in a handy box. For the Refresco Superior, my box included a bottle of Bacardi, a bottle of St-Germain, the cilantro-ginger simple syrup and a bunch of limes. 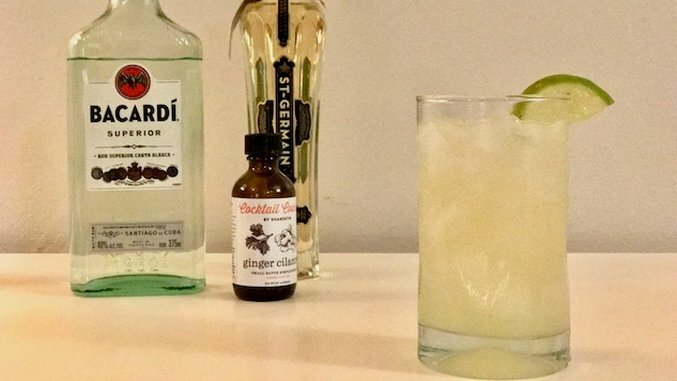 The cocktail itself proved to be easy to make—just four ingredients and I had all the tools on hand in my kitchen. Check out the recipe and give it a shot at home. And repeat after me: Every day is National Rum Day. Directions: Chill a Collins glass in the fridge or freezer. Cut and juice one lime (should give you a little more than one ounce of juice). Add all the ingredients to a cocktail shaker with ice. Shake like a polaroid picture. Take the Collins glass out of the fridge and fill it with ice. Strain the cocktail into the glass and garnish with a lime wheel. Cilantro-ginger syrup: Add 1 cup water and 1 cup sugar to a pot and boil. As it begins to boil, add a cup of cilantro and eight ounces of peeled ginger root. Bring to a simmer and remove from heat. Let it steep for 30 minutes or more. Strain the syrup and you’re good to go.